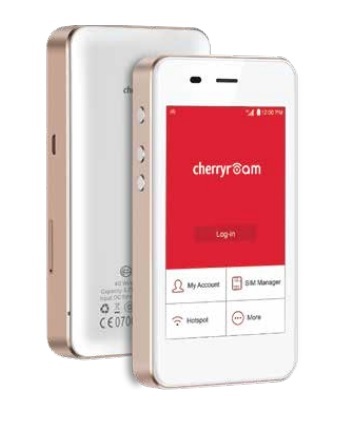 CherryRoam provides up to 4G LTE-connectivity with fast, stable, and secured internet connection to over 100+ countries worldwide. The device is powered by GlocalMe™, the global leader in CloudSIM technology. Cherry Mobile Communications’ vision has always been about providing affordable connectivity to all Filipinos. Since the launch of Cherry Prepaid three (3) years ago, we have offered affordable data, call, and text rates with significantly longer validity to our subscribers. Now with the launch of CherryRoam, we are extending that affordable data connectivity not just in the Philippines, but globally. This partnership with GlocalMe™ will surely empower all users to gain global data access to more than a hundred countries at competitive rates,” shares Jacy Chua, CMCI’s Chief Finance Officer. CherryRoam sports a 4-inch touch screen display with compact built, exterior, and real-time data monitoring. It is packed with a Qualcomm 4G LTE chipset – enabling fast connectivity especially at 4G speeds and allows five (5) users to connect. It can also be used as a local WiFi device as it houses two (2) Nano SIM card slots. More than that, CherryRoam also doubles as a power bank with its 5,350mAh battery and15-hour standby time. Customers can purchase any data packages weeks or even days before their scheduled travel. They have the option to control their usage through the CherryRoam app which can be downloaded in Google Play or App Store. With the app, users can manage their data packages, monitor data usage, or top-up credits – offering more convenience and ease to the consumers. With over 100+ destinations globally that it covers, travelers can also choose from special packages at an affordable rate. The device’s flexible rates empower users to select the data package suited to their travel needs. Plus, they can purchase roaming voucher credits which have no expiration dates. Moreover, CherryRoam also offers ‘Unlimited Day Pass’ with 1GB high-speed data and unlimited browsing Internet access.